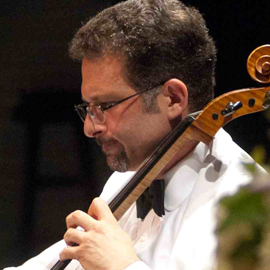 PETER SANDERS, cello, is a native New Yorker and a graduate of the Manhattan School of Music. Mr. Sanders is a member of the New York City Ballet Orchestra (for which he has served as Acting Principal), performs with the Riverside Symphony, the Stamford Symphony and has performed and recorded as a guest artist with the Perspectives Ensemble. He has toured Southeast Asia twice with the New York Symphonic Ensemble and as concerto soloist with the group performed in concerts in Taipei and Singapore. He is Artistic Director of the Central Vermont Chamber Music Festival, which had its inaugural season in 1993. Mr. Sanders was a winner of the 1998 Artists International award as a member of the Hollaender Ensemble and is currently a member of the Ariadne Trio. He has participated in many summer festivals including the Colorado Music Festival, Skaneateles Festival, Crested Butte Chamber Music Festival, Eastern Music Festival (faculty position), CVCMF, Lancaster Festival, Ohio (where he was principal cello from 1992-98), Windham Chamber Music Festival, the Sherman Chamber Ensemble, the Park City & SLC Autumn Classics Music Festival and the Moab Music Festival. As a studio musician Mr. Sanders has recorded for a variety of popular artists including Pat Metheny, Jewel, Kathie Lee Gifford, Andy Bey and Carlinhos Brown. He can be heard on the Delos, Muse, Bridge, RCA Victor-Red Seal, New World, On the Lamb and KOCH International Classics labels. Radio and television broadcasts include WQXR, NPR's "Performance Today", PBS and Vermont Public Radio.